Wayne Selden Jr. helped out his childhood friend, Timmance McKinney, when the latter reached out about funding for an AAU team he's overseeing. The Bulls guard is keeping the door open for a group of kids to ascend in basketball similarly to how he's managed to reach the NBA. Wayne Selden Jr. just needed a chance. The Chicago Bulls shooting guard has had to work hard for every opportunity he’s earned, hustling at AAU circuits through the prep level before starring at University of Kansas. He travailed in the G-League before reaching the NBA. Now, he’s nearing the the end of his third career season in the league. An important offseason for Selden approaches as a long season draws to a close. There’s not much left to play for on this particular evening—Chicago is visiting Madison Square Garden to face the Knicks, a fellow Eastern Conference bottom feeder. Both teams have long-been focused on what’s ahead. But Selden, a 24-year-old free-agent-to-be, still has something to play for now: another chance to prove his worth to his current team or elsewhere. An hour before tip-off, he and teammate JaKarr Sampson, an NBA journeyman himself, are out on the floor hoisting shots. They’re the last Bulls players out there as patrons begin filing into the arena. Selden works up a sweat before turning back towards the locker room. Selden’s effort doesn’t go unnoticed. But, at least this year, his play won’t keep the Bulls’ season alive. That wasn’t necessarily expected when Chicago acquired him midseason from the Grizzlies. Nonetheless, in the midst of the Bulls’ underwhelming campaign, Selden managed to rescue another team before it even began. Selden grew up in Roxbury, Mass., a neighborhood just outside of Boston. His childhood friend, Timmance McKinney, grew up in nearby Jamaica Plain. They met when they were in elementary school and played on the same AAU basketball team coached by Selden’s father. The two attended different high schools, but they kept in touch, sometimes practicing together. A part of the reason McKinney recalls gravitating towards Selden was his work ethic. They were 14 when McKinney remembers going to an open gym, where they would play one-on-one. Sometimes, McKinney says, Selden would take 50 shots from the same spot, working tirelessly to perfect his craft. Their paths would further separate entering college. Selden was a three-year starter at Kansas, securing All-Big-12 Second-Team honors his junior season. He declared early and went undrafted, latching on with the Memphis Grizzlies for five preseason games before being waived. Memphis’ then-D-League affiliate, the Iowa Energy, acquired Selden. He played 35 games for the Energy, averaging 18.5 points per game, before the New Orleans Pelicans signed him to a 10-day contract in March 2017. Selden parlayed a three-game stint with New Orleans into a two-year contract with the Grizzlies just over a week after making his NBA debut. He played in Memphis across three seasons prior to being traded to the Bulls in January. McKinney says he once visited Selden while he was with the Grizzlies and saw firsthand just how hard Selden was working to get better. Meanwhile, McKinney’s path saw his pro dreams end. He didn’t meet the NCAA’s clearinghouse rule requirements, preventing him from attending a Division I school, despite garnering some interest. He attended Colorado Northwestern Community College, where he continued playing. Upon finishing, he felt called to aid the youth in his home community, particularly those at-risk and came from single-parent, low-income households. He worked with students within the Boston Public School system before he decided to start up a mentorship program for kids between sixth and 12th grade. Twenty boys from all over the area, including High Park, Jamaica Plain, Roslindale and Roxbury, make up the group. But the urge for McKinney to get involved in basketball remained. Initially, he served as an assistant junior-varsity coach at St. Joseph Prep in Boston. But then the kids in his mentorship program urged him to start an AAU team. “It was like, ‘Why not?’” McKinney says. 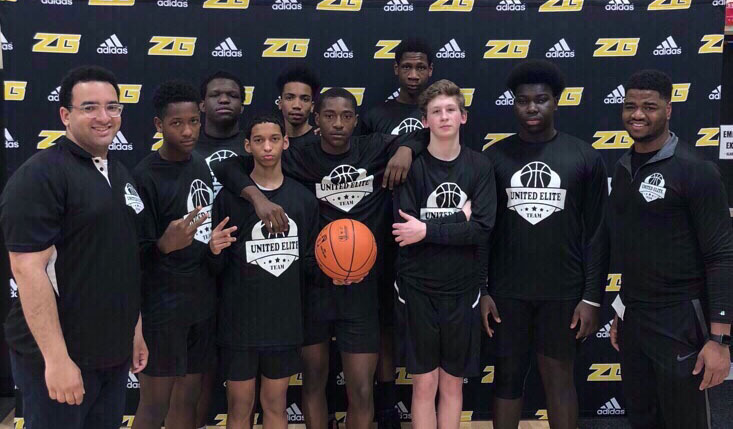 Ten members of the program formed United Elite. The team often practices at Nativity Prep in Jamaica Plain—located a minute away from McKinney’s grandmother house where he grew up. Timmance McKinney (far right) oversees United Elite, an AAU team comprised of players from neighborhoods surrounding Boston. Selden later offered to fund the AAU team through the summer. McKinney, who says he wasn’t surprised, admits he was psyched when he found out. He waited before telling the kids at the end of a practice, who excitedly rejoiced at the news. Some immediately called their mothers to explain the team would be saved. In addition to funding, Selden plans on paying the team a visit during the summer. When asked about why he decided to contribute, he folds his arms over his knees on a bench in the Bulls locker room and responds dutifully. McKinney says both he and Selden, in some capacity, owe participating in AAU for leading them to where they are today. Each credits AAU for providing a productive outlet for kids in their neighborhoods to partake in and forge lifelong friendships. Additionally, it opens the door for someone to ascend to the highest levels of basketball, at the prep, collegiate and pro level. Familiar with such opportunities, perhaps it’s fitting that Selden is making for a group of kids to potentially do so now.